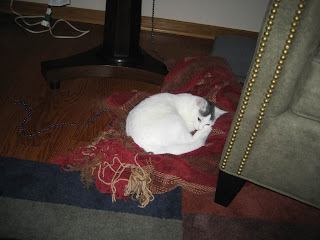 ... and one taking advantage of the make-shift tree skirt that has fallen to the floor. Yes, that's a garland of purple beads that's hanging loosely, as well. Once a day I make the rounds, picking up and replacing all the ornaments I find on the floor, and re-stringing the garlands. 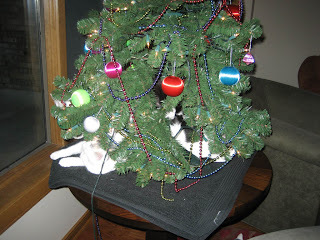 There are no breakable ornaments, and no tinsel, so no harm done, and we are all greatly enjoying the tree. It's still standing! Good kitties!